Opened Oct. 1, 1971, the first theme park at Walt Disney World Resort sits on 142 acres with the 189-feet-tall Cinderella Castle at its center. Similar to Disneyland in California, Magic Kingdom is divided into six themed lands — Main Street, U.S.A.; Adventureland; Frontierland; Liberty Square; New Fantasyland; and Tomorrowland. Popular attractions include Pirates of the Caribbean, The Haunted Mansion, it’s a small world, Space Mountain, Splash Mountain, “Mickey’s PhilharMagic”, Big Thunder Mountain Railroad, Jungle Cruise, The Hall of Presidents, Mad Tea Party, Buzz Lightyear’s Space Ranger Spin, The Many Adventures of Winnie the Pooh, Country Bear Jamboree, Dumbo the Flying Elephant, Enchanted Tales with Belle, Under the Sea ~ Journey of the Little Mermaid and Princess Fairytale Hall. Off Interstate 4 on Walt Disney World Resort property, Lake Buena Vista, Fla., approximately 22 miles southwest of Orlando. 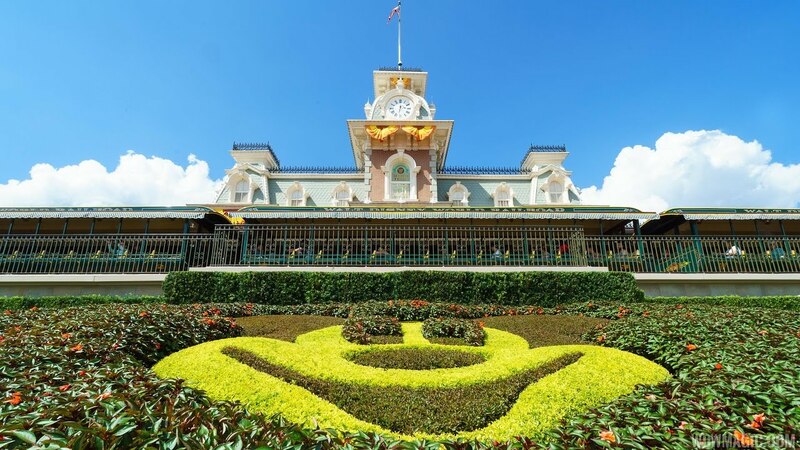 The Magic Kingdom theme park - Disney's first theme park in Florida - has seven themed lands featuring attractions built around wonder, fantasy and fun. It also features food locations and merchandise locations. Eventually, all the lands came together with their own unique themes. Ordinary buildings were cloaked with intricately designed exteriors and interiors. Details were installed and the final coats of paint were put on. Imagineers used an architectural trick called "forced perspective" to make buildings look taller than they actually are. They shrunk windows, balconies and even furniture on the second floors and shrunk any third floors even further to achieve the illusion of tall buildings climbing far into the sky. To complete the feeling of being in a three-dimensional movie, background music was created for each particular land, as if it was part of any film's soundtrack. In the end, it took more than 9,000 workers to build the world's most famous vacation resort. 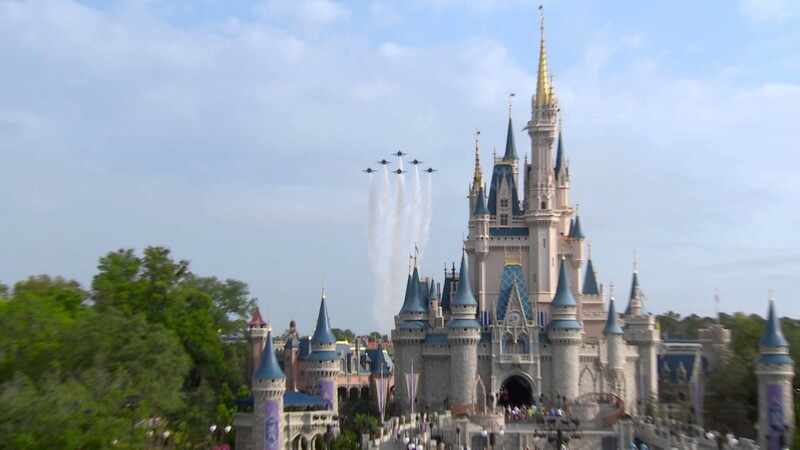 The Magic Kingdom park occupies 107 acres. It is located off Interstate 4 on Walt Disney World Resort property, Lake Buena Vista, Fla., approximately 22 miles southwest of Orlando. 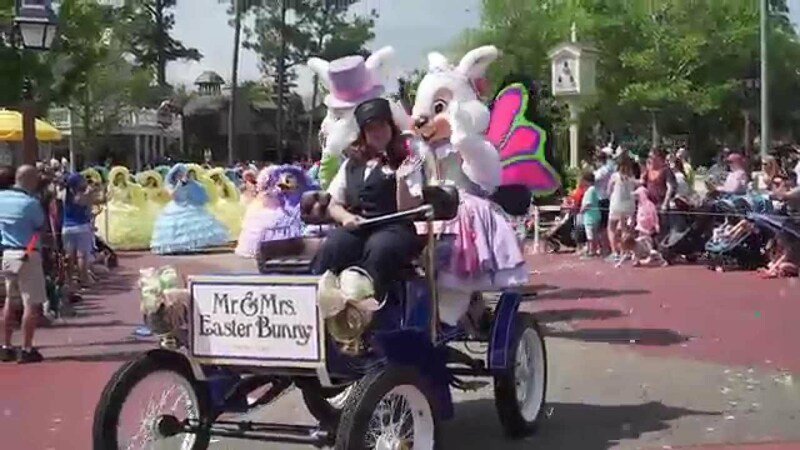 Food locations are situated throughout the Magic Kingdom park, with character dining opportunities located at The Crystal Palace at Main Street, U.S.A., and Cinderella's Royal Table at Fantasyland. Priority seating for full-service restaurants can be made at City Hall on the day of visit or in advance by calling 407/WDW-DINE. Walt Disney World Railroad (1971): A grand circle-tour of the Magic Kingdom park aboard an authentic steam train. Mad Tea Party, Dumbo the Flying Elephant, and Peter Pan's Flight (all 1971): Attractions inspired by animated Disney film classics. It's a Small World (1971): Hundreds of doll-like figures sing and dance in their native costumes. Jungle Cruise (1971): Board from a last-outpost river landing to observe curious gorillas, playful Indian elephants in their daily bath and frolicking hippos created in life-like realism by Disney artists. Country Bear Jamboree (1971): The zaniest troupe of singing bears ever assembled celebrate old-time music with a foot-stompin' beat. Hall of Presidents (1971): The most impressive moments in American history are presented in life-like realism with all of the nation's chief executives on a single stage through the three-dimensional magic of Audio Animatronics. Diamond Horseshoe Saloon Revue (1971): Where dance-hall ladies and elegant gents sing and dance. The Haunted Mansion (1971): The liveliest collection of ghosts ever assembled for all to see as they travel through ancient rooms. Pirates of the Caribbean (1973): Aboard buccaneer launches, adventurers travel through mysterious grottos, then plunge down a waterfall and into the midst of a pirate battle for control of a harbor town. Tom Sawyer Island (1973): Log rafts take guests across the river where Injun Joe's Cave, the Magnetic Mystery Mine and old Fort Sam Clemens await exploration. Space Mountain (1975): Action, speed and perpetual motion await as guests "blast off" into night skies for a twisting, diving "return-to-earth" aboard miniature space shuttles. Big Thunder Mountain Railroad (1980): A wild ride on a runaway mine train. Splash Mountain (1992): A log-flume ride with one of the world's longest flume drops -- a five-story, 47-degree descent reaching speeds of nearly 40 mph. The Barnstormer (1996): A kid-sized roller coaster zips and zooms through Goofy's Wiseacre Farm in crop-dusting biplanes. Buzz Lightyear's Space Ranger Spin (1998): Board your star cruiser, grab hold of your laser cannon and help Buzz defend the universe from the Evil Emperor Zurg. The Enchanted Tiki Birds-Under New Management (1998): Hollywood featherweights Iago, from Disney's animated feature "Aladdin," and Zazu, from "The Lion King," have become the new landlords of this classic attraction, creating a witty, upbeat show filled with old and new choreographed musical numbers. The Many Adventures of Winnie the Pooh (1999): The whole gang's here, joining guests on a journey into the Hundred Acre Wood. The Magic Carpets of Aladdin (2001): Genies, flying carpets, magic lamps and Middle East mystique inspires this new attraction. Main Street Electrical Parade nighttime parade with spectacular lighting effects. The Dapper Dans barbershop quartet on Main Street, U.S.A. 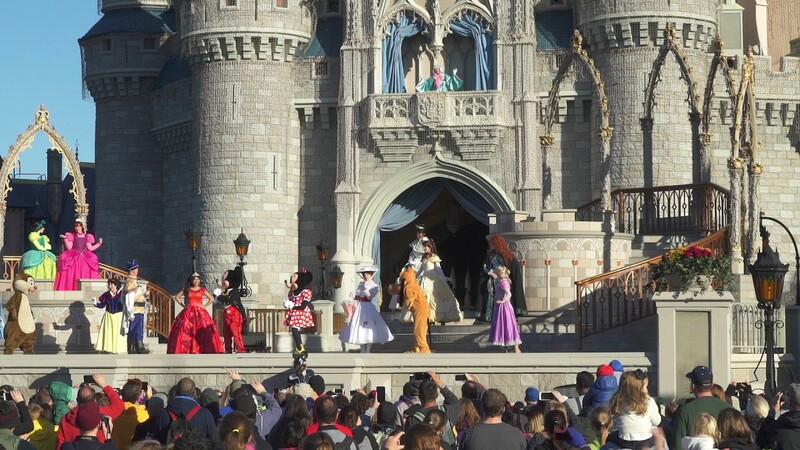 Character greetings throughout the park. High school bands, dance and musical groups from throughout the world.